Steel News is an online publication created by the Association for Iron and Steel Technology (AIST) for the steel community featuring the latest headlines about steel producers, suppliers, technology, trade, environmental and safety issues. Primary content for this website comes from news releases supplied by steel producers and industry suppliers. If you would like to get news coverage for your company, please email Sam Kusic, Steel News editor to submit a news release for consideration. The Association for Iron & Steel Technology (AIST) is a non-profit organization with 17,500 members from more than 70 countries. 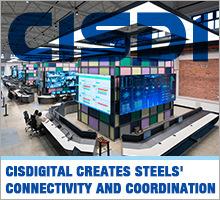 With 30 Technology Committees and 22 Local Members Chapters, AIST represents an incomparable network of steel industry knowledge and expertise. Our mission is to advance the technical development, production, processing and application of iron and steel. Primary content for this website is derived from news releases from steel producers and industry suppliers. If you are interested in submitting a news release for consideration, please email AIST’s industry news editor, Sam Kusic.